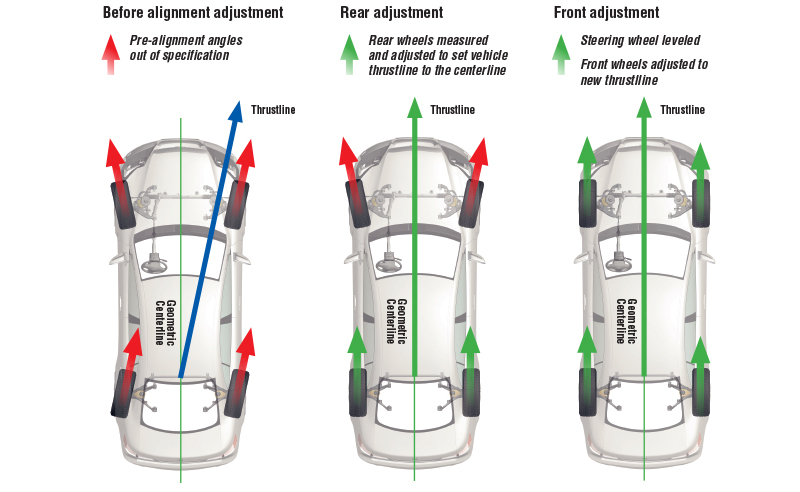 Wheel alignment, or tracking, is the process of ensuring your vehicle’s wheels are set to the correct position, as specified by the car manufacturer. Incorrect alignment can result in rapid and /or irregular tyre wear and can even affect the handling and safety of the vehicle. Wheel alignment issues can be caused by a number of reasons - hitting a kerb, driving into a pothole in the road or by excessive wear to steering or suspension components. Checking the wheel alignment on your car or van regularly can prolong the life of your tyres by up to 12,000 miles and increase fuel efficiency, due to the reduced rolling resistance with the road – saving you pounds at the pump. So, it is important to get your wheel alignment checked at least annually to ensure you get the most out of your tyres and more importantly for your own safety and that of other road users. At Farmer’s Tyre we use the latest in laser wheel alignment to carry out 2 and 4 wheel alignment as well as castor adjustment. Please call us on 01926 632269 to book your vehicle in.